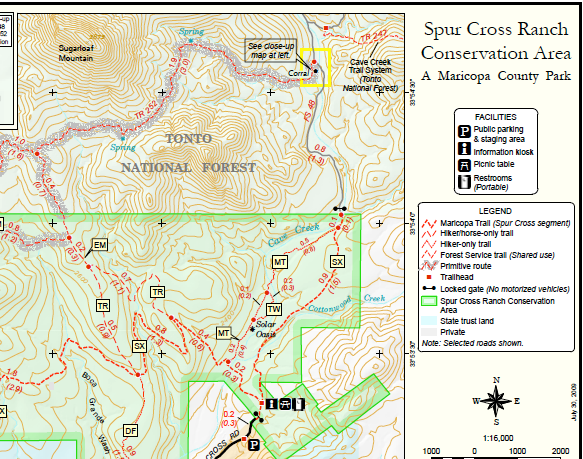 I went hiking with Mr. Bosseh-Pants at Cave Creek's Spur Cross Conservation Area today. Cierra stayed home but I should have brought her, we crossed the creek several times, and passed two water springs. We basically hiked the big loop you see on the map, about seven miles. 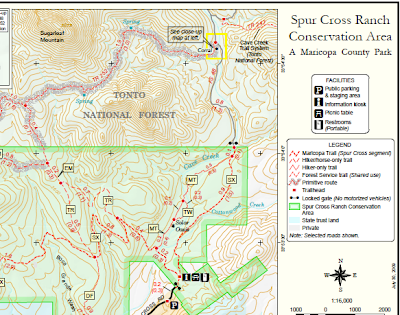 I've hiked a lot of Spur Cross but not this far North. It was beautiful with wildflowers everywhere. I'd like to do this hike again soon. Normally I walk through the water because I'm a wild child like that. This may have been the only exception. I could title this photo "speak softly and carry a big stick". My mom made the walking stick, thanks Mom. This is where I sat and had lunch. A fluttery reminder of Dayle.